Is it possible to use inbound marketing to quickly generate a large number of qualified leads for a startup just out of stealth mode? If you are Owl Labs VP of Marketing Rebecca Corliss, the answer is "yes." 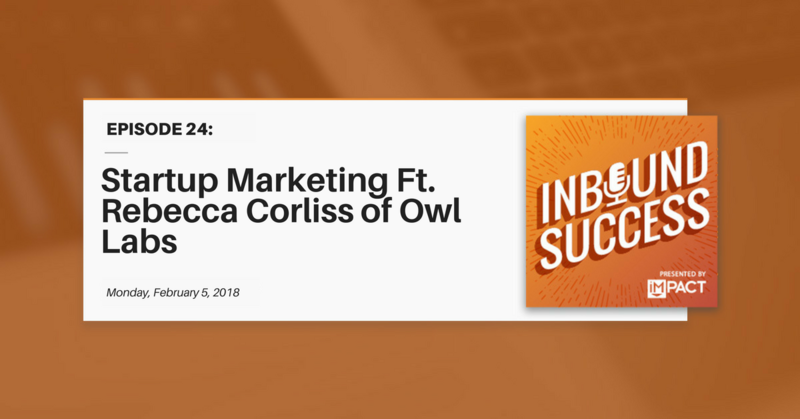 In this week's episode of The Inbound Success Podcast, Rebecca shares the strategy behind Owl Labs' first major lead gen campaign, and what went into producing hundreds of qualified leads just a few months after the company's launch. Listen to the podcast to hear more about how Rebecca is using inbound marketing to take Owl Labs from startup to scale up, or read the show notes below for a quick summary. Kathleen Booth (host): Welcome back to The Inbound Success Podcast. This is Kathleen Booth, and I'm your host. Today my guest is Rebecca Corliss who is the Vice President of Marketing at Owl Labs. Welcome, Rebecca. Rebecca Corliss (guest): Hi. Welcome. Thank you so much for having me. I'm very excited to be here. Kathleen: I'm so excited to have you. I have to give everybody, Rebecca and the guests, a disclaimer today. I was saying this is the perfect storm of working from home. I work out of my house and normally I have a great mic set up and a really quiet office that's my recording studio, and today life has happened and I have my roof being torn off my house and replaced. I have an 11-year-old child who is home from school and who had to have his screens taken away from him so he's definitely bored and bothering me every five minutes. I have two dogs that seem to be barking at the roofers. So, who knows what's going to happen on this podcast. We're gonna role with it. We'll see what happens and it's somewhat related to the topic we're going to talk about which is remote work environments and how to make them work. So Rebecca, with that being said, tell us a little bit about yourself, and your background, and what you do at Owl Labs. Rebecca: Yeah and I love your story. I love your example for today. The fact that life can go on and you can continue doing your job and making this happen, and still be successful is incredible, and that really comes to what our mission is about. To tell a little bit about me, my name is Rebecca, VP of Marketing at Owl Labs. I joined Owl Labs last April of 2017 so I'm coming up on my one year. Very, very exciting. It has been a whirlwind. We'll talk all about that and really what it comes down to is we create a product called the Meeting Owl. It is so cool. It is the reason why I joined this company. To give the short explanation, it's a three hundred and sixty-degree video conferencing camera that goes in the center of the table. You can imagine how terrible meetings typically are for remote employees. What it does is, since it's in the center of the table, it uses audio and visual cues to automatically look at someone when they start talking. And so the result of that is an experience that's extremely natural. You get to see people while sitting at the table almost with the same perspective that they have - as if you're sitting there with them - and it completely changes the game. Frankly, I wish I had that in previous jobs. Kathleen: I can say I'm a customer of Owl Labs. So at IMPACT we have an Owl which is what we call the device. I think we even have a name for it. And because I work out of my house most of the time I spend virtually all day, every day on video calls. We happen to use Zoom and a lot of my calls are internal because I run our internal marketing department and just this morning, for example, we had our daily stand up and team meeting using the Owl. So it's something that I use all the time. I totally appreciate it because it is really frustrating especially if you're one of the only remote people and you're meeting with a group that's sitting in an office. I think they take for granted that they can see everybody's faces and have a face-to-face conversation, but for us, being remote it's really nice to be able to see somebody's face and follow the conversation in that way. So, great product. Kathleen: Yeah well we love using it and because we've had some interactions through our use of the Owl etc., I got familiar with some of the work you were doing as a marketer. Before we get too far into the campaigns though, I wanna know how the heck you guys came up with this product because there are lots of video cameras out there that can be used for this type of thing, but this is a pretty unique device. So where did the idea come from? Rebecca: Yeah, great question. So the idea for the Meeting Owl came from our CTO, Mark Schnittman. He was a remote worker himself. This is prior to starting Owl Labs. He was based in Boston and working for a startup out on the West coast and he was actually surprised to find that working remotely was okay. It worked pretty well. He had never been a remote employee before and he thought it was great aside from team meetings. So similar experience that you just explained. It's like you're watching a bad TV version of a meeting instead of actually being there to participate and so anyhow one day ... oh and a little bit more of a background for Mark. Rebecca: And he just started swiveling it to turn to whoever was talking and Mark thought oh my goodness this is so much better and wait, I'm a roboticist! I can build this. Rebecca: It was great. So anyhow, that was really the genesis of the idea in terms of how could you automate an experience that let's you feel like you had a face-to-face meeting with a group and it's taken off, and it's been great. I think he was on to something. Kathleen: Yeah and it's neat because it does look like a little Owl and of course owls, you know, are famous for being able to turn their heads in crazy directions that people can't. I love the product name and all the branding around it too. Kathleen: You've done some interesting marketing campaigns lately. Owl Labs really is pretty much still a start up in many respects, but you're growing really quickly and I was just excited to dive into a couple of the campaigns that you've had recently and talk about them, and the results you've gotten, and what's made them so successful. So I'm gonna actually turn it over to you and have you tell us a little bit about the work you've been doing. Rebecca: Absolutely. So being a part of Owl Labs has been amazing. Just for some context, when I joined we were still in stealth mode. We had not launched the company. There were a few articles around if you really search hard, but we had not launched the company. We had not launched the product and so we were starting from zero basically which is one of the reasons why I was so excited to join. Talk about an exciting marketing challenge, bringing a company into the world. We launched the company in May of 2017, only a month after I joined, and then the product in June, and then from there it was an opportunity to really think about what were some of the inbound marketing campaigns that we wanted to run to really increase Owl's exposure, introduce the Meeting Owl to new organizations, etc. A few things that we learned off the bat was who are our best customers, doing our persona research, etc. It turns out we had a few. One probably very obvious being a video conferencing device is IT. Another we found was actually a department head, someone who runs regular team meetings and really, really cares about his or her department and employees, and flexibility, etc. Then the third is the remote employee. It makes a lot of sense. It can be very painful. Rebecca: So we really wanted to make sure we were serving at that end as well. So with that, one of the things that I wanted to do was a half brand-oriented, half content-oriented, and obviously sales-oriented, which is how can we add more data to the world about remote work and help educate people in regards to how remote work is growing, how this is impacting businesses, and what people can expect for some benchmarks to compare themselves? Thus came the genesis of The State of Remote Work, which was our first big campaign which we did in October. Want me to dig into some of the process in terms of how we went into that? Kathleen: Yeah, I would love that. It sounds like you identified your audience and you identified a theme that you wanted to talk about. Walk me through exactly, knowing the audience and the theme, what's next? How did you come up with the campaign ideas? What was it comprised of and what did you guys do? Rebecca: A few things that we had learned so far were, one, PR was very successful for us. And so if we had some data points that had not been recorded before or a bit unique, we thought we had a good shot of getting media coverage or even blog coverage. That was one. So how can we get those interests and unique points. Two, from an SEO standpoint, our SEO was nearly non-existent. Having come from stealth into a new website into the world, I needed to think about how I could generate authentic and valuable links quickly to support our organic search. So knowing that people love to reference data in their own content, I thought that would be a way to contribute to that. So that was another goal. Then, third, was can I use this as an opportunity to generate a new audience with people who are really, really invested in learning about remote work both from the remote employee's side or the manager's side, and how could I have something that's genuinely helpful to them that would help attract them to our website and discover us for the first time. So those were the big goals for that. Kathleen: I love that you decided to focus on data and I love how you connected the dots between we need backlinks, right, and what is something that we can create that is backlink worthy? I feel like that's something we as marketers know. We know we need to get links on other sites, but a lot of marketers are not very strategic about how they go about doing that. Either they create a ton of blogs and just kind of hope that people will link to it or they have a strategy of reaching out and kind of spamming and asking people for links. But, being more strategic about thinking in terms of the type of content and what's really going to be appealing makes so much sense. How did you gather original data? I mean that seems like it could be a huge undertaking. Rebecca: Oh it was very challenging and so one of the things that I'm thankful I did is realize what you can do and what you can't. What I can do is create content, work with great teams, analyze data, etc. What I couldn't do at that time is drive a large audience to take a survey because I had no audience. One of the things I decided to do, which was a really great call, was to find a partner that I could work with from a co-marketing standpoint, and just be really upfront, and tell that organization "I can't promote, but I can create." Let's go in on this together, get the shared benefit of strengthening our own thought leadership around remote work, etc. So I went to my great friends at TINYpulse. Awesome organization. Really, really thoughtful about content as well and educating and supporting employees. So it was a really, really natural fit. And what we did is, we shared promotion of this main survey, the survey that I created, which I had never done before. Never done something like that. It was very fun and frankly TINYpulse sent it to 90 percent of the folks that took the survey, which makes a lot of sense, and then we had the data and then I did the heavy lifting in regards to analyzing it, putting together the content, working with a little organization called IMPACT to design. Very thankful for that support. And it ended up working really, really well to come together. I am a team of one at Owl Labs and so the time it took to collect data, analyze, and then work with IMPACT to design was maybe a month and a half, which is long in the startup world. Kathleen: Did you have a goal as far as the sample size you wanted for the survey? Rebecca: I did. I wanted over a thousand. That was important to me, a thousand people taking the survey, for two reasons. One, is that's a group you can then promote the report back to. Rebecca: Which is great. And the other is just the data validity. I wanted to make sure I had a sample size that was worthy of whatever press we could try to gain and obviously the data would be much more impactful if we had a large sample size. Rebecca: Landed which was really really good. Kathleen: Now did you incentivize people to complete the survey in any way? Rebecca: I did. What I wanted to do ... my philosophy, and I stole this from HubSpot, my previous employer that I loved very much. I wanted to raffle off gift cards. It was gift cards to Amazon and I wanted to give away enough where the odds felt good. So it was twenty, 50 dollar Amazon gift cards which was pretty pricey for us as a startup, but I wanted to do that so folks really felt like they had a good shot of winning instead of like the one or the two. It would be interesting to know how the conversion would be different if we did a different type of raffle, but we didn't. Kathleen: Yeah, that would be fascinating. But, it sounds like it worked, which is good. Did you also have any sort of component where you told the people that participated in the survey either they could get an advanced look at the data or a more robust data set or anything like that? Rebecca: No. I let it be opt-in to receive the report. At the very, very end I wanted to be thoughtful about people's ability to stay anonymous if they wanted to and so I just let them be an opt-in. I didn't do anything special in regards to the content. But, no not in that case. Kathleen: Great. So you got all this data. You crunched the numbers and you came up with some trends and some other high level insights and takeaways. What next? Rebecca: Since one of my goals was links, I wanted a beautiful page worth linking to, and I wanted the content to be completely open. That was important to me as well. I had a vision for a really beautiful, dynamic not necessarily interactive, but a dynamic page that would move and shift as you scroll to really capture your attention, want to have you continue to look through the data points and really discover the interesting pieces. I am not a designer at all and so that was where I reached out to IMPACT to see if I could get support in the creation of this report. I'm really, really happy with how it came out. It's beautiful. So that was excellent. Then the next piece was, can we generate some context from this, some new leads? We are an eCommerce business primarily. We don't have a sales team to follow up on leads, so the reason we tried lead generation in this case is could we do some sort of email follow up to these folks who are invested in learning about remote work and see if we could introduce the Meeting Owl to them as a way to better support the remote employees. So contact generation became the next big goal for that. Kathleen: Going back to the actual format of the content, this was interesting to me because I first heard about this internally within the agency. One of the designers mentioned she was working on creating it and she referred to it as an infographic. She said "I'm building an infographic" and of course in my mind I pictured the classic long, thin, infographic, static image. Like a JPG basically that was a data visualization. What I saw and what was created - it was really different. As you described it, dynamic, is a great word I think. It's really a webpage that is a data visualization, but it moves, it responds, it does things. Why did you choose to go that direction instead of the classic infographic? Rebecca: Yeah, that's interesting. I think I'm really inspired by some of those New York Times beautiful graphics. they're truly interactive and will change based on the different inputs and what not, but I personally really love those and I think they're beautiful and very shareable. One of the limitations of infographics is the format, that can be quite narrow. It's good for embedding, however, not necessarily as good for sharing or viewing and so I really wanted it to have space, be something you can scroll and take your time, highlight or screenshot specific graphs if you wanted. I really wanted each data point to stand on its own and so that's why I thought the space was important versus crammed into a smaller infographic. Kathleen: That makes a lot of sense. When you look at some of those infographics on your mobile phone, for example, they make it so tiny you really can't see much. Going back to your original goal, you talked about the goal being backlinks and with an infographic it is very easy to embed it or to even like right click and copy it, and put it on a page, and not even to credit the source. But, it's interesting that you chose to go the direction you did because really somebody needs to share the link to the page in order to really share the whole set of data. Rebecca: Thank you. It was all instinct. I can't give anything other than gut and just what I personally enjoy and really focusing on the experience and value. So I think those were good intuitions and I'm thankful for those. Kathleen: Yeah. Now so your next goal was to potentially capitalize on the contacts you were making and put them into some kind of a nurturing sequence and see if you could bubble up some qualified leads from that. Tell me a little bit more about what the nurturing sequence looked like because I do find that sometimes it can be challenging to take a conversion that comes in off of something that really isn't product related and navigate, shifting the conversation with that person to something that is product related in a way that doesn't feel very forced or unnatural? Rebecca: Yeah that's a great question and it was brand new. I had no idea if it would work. This was my first time creating valuable content that was somewhat distant from the product. The only similarity being obviously those that care about remote work would invest their time in looking at it and those were the folks that would be a good fit. It was very, very interesting. So the way I wanted to make a connection to that and start that process ... well first the two different conversion events we put on the report. One, pretty straightforward. You could download the slides to PowerPoint format if you wanted it in the easiest format to put in your own PowerPoints etc., however you want to do that. So that was one. That was a strong conversion, but not the primarily contact generator. The stronger was an ebook. I want to give a shout out to Upwork. If anyone ever wants like a very quick and scrappy freelancer, I found a wonderful writer on Upwork and I wanted an ebook on how to manage remote employees. I thought "okay, why don't we see if we can figure out who are the managers that are among this group" because those that are in the mindset of improving how they support remote employees might really be a good fit for the Meeting Owl. So we wrote an ebook giving some great tips on how to do that in very very simple and straightforward within the report, I think it's midway through, we say do you want to learn how to basically put some of these thoughts to action? Do you want to learn how to improve how you manage remote employees and that went to a simple landing page. I requested very, very little information on that landing page intentionally for the sake of increasing the amount of contacts we get. I think there was only name, email, and we asked for persona which is are you a manager or IT, etc. That was it. I have to admit it blew my mind how many contacts we generated. We had a stretch goal of 400. That was like, you know, that would be pretty crazy, but let's go for it. We got 480. Rebecca: I couldn't believe it. I couldn't believe it. And that worked really, really well and it happened so quickly. I got 400 over the course of a few months. This was 480 in a month mostly around the time of launch. So I can work quickly in terms of creating my lead nurturing. I hadn't built it yet. Rebecca: I hadn't built it. Kathleen: I just talked to somebody else who had the same experience. They said the same thing, I just didn't expect to get results so I had nothing built. So we were building on the fly. Rebecca: Yeah, it was funny. So I had to do that very very quickly. I remember even ... I was sending ... well I call it building a bicycle while you're riding it. Rebecca: As a metaphor. So I was sending manual follow ups as I was building the nurturing to actually get people in it and all that. It was actually funny. Anyway the long and the short of it, the flow that I ended up creating was ebook and then the next was meetings. So going a bit deeper I wrote a blog post that was about how to better include your remote employees in meetings and that's where I introduced the Meeting Owl for the first time. It was a subsection of that blog post and then from there the next was do you want to see this for yourself? Do you want to see what a meeting optimized for remote employees looks like? And there was an opportunity to either go to one of our live demos - we do live demos every week which are very fun - or a recorded demo depending on their convenience and schedule. And so that was the flow that we created. Kathleen: That's great. So it sounds like, and correct me if I'm wrong here, but it sounds like the ebook really served to kind of bridge that divide between something completely not product related, but very persona related, and then moving into a conversation that was a little bit more directly product related. Rebecca: Yeah, exactly. Knowing that one of our main buyers were those leaders, managers, department heads, etc., because they have buying power and they're truly as invested in improving the life of their remote employees as you can get, we knew that speaking to them in a way that supports them in that mission would work well and we just kind of got more finely tuned to bring it to meetings, the meeting pain particularly, and that's when we can offer a solution if they happen to share that pain. Kathleen: Yeah and I like hearing that whole chain of events because you are in a situation where you don't have the luxury of just having a conversion offer that is "speak to a salesperson." You have to put those breadcrumbs down along the path and lead that person right to the point of purchase on your website. So it kind of does force you as a marketer to really think through what is the logical progression of the questions that somebody would ask, the information needs they might have when we start with just the topic of remote work and want to go all the way down to buying a video conferencing camera. It really does force you to get to know your personas very well. Rebecca: I can actually give a little antidote of something that totally failed. Kathleen: Oh I'd love that. That's great. Rebecca: Yeah so as we were building this lead nurturing, while we were running it, one of the things I try on the thank you page of the ebook, I was using the HubSpot Meetings setup tool, and I thought "I wonder if people will ever sign up for a remote consultation or a remote employee management EVAC session?" I don't know something like that, but a chance to get on the phone and talk one on one to work through what your current strategy is to support remote employees and how you can improve it. Anyway, no one signed up. Rebecca: No one wanted it and it makes sense. It makes a lot of sense. That was really funny to say okay cut and dry. Kathleen: But I love that you tried it. I feel like that's what marketing has to be all about these days is "let's throw out these experiments and let's see what's working and let's get rid of what isn't and let's double down on what it is." Kathleen: So going back to the large number of leads you got and so quickly on that ebook, did all of those leads first land on the infographic or did some of them come to the ebook directly from other sources? Rebecca: Oh great question. Our majority came through the infographic. Far, far, far majority. We were doing some paid social to promote the ebook on its own, but I would say that maybe only 10/15 percent and the cost per lead was so high that we thought, let's just continue to support the promotion of The State of Remote Work on its own because the conversion was better, it was free, and so far the majority came from the infographic. Kathleen: Can you tell me a little bit more about what you did, and I imagine TINYpulse may have done some also, what you did to promote the infographic itself? Rebecca: Yeah, so a few different levers. So on the TINYpulse side, they have a great and amazing engaged audience. So to those who did either the survey or their audience they just sent it to everybody. It was excellent because it had a very high ... I don't know their specific conversion rate, but had a very high conversion rate because it was open content and anyone could view it so that was great. So it was email and then there was a blog post on their blog and then they did social and paid social through their channels which was great. On our side, we didn't do email other than our own people who signed up for the reports. So a small email and then our big lever was actually PR. So I was working with the PR team and we did a formal press release pointing out some of the primary stats and then we had been reaching out for about a week and a half prior to blogs and outlets like Recruiter.com, Forbes, etc., those writers that have been really interested in remote work and employees, etc., and basically giving them access to the report a little bit early if they wanted to write about it at launch. And that went really, really well too. So referrals ended up being maybe, like referral traffic, maybe about a sixth of the website traffic which is good. What surprised me, and this was cool, and this reminds me like yeah I know marketing is great. I was watching our stats and I'm thinking we're getting a whole lot of traffic from social. Where is this coming from? I dig deeper and I say this is all Linkedin. We got 1,200 visits from Linkedin in the past day and a half. How the heck did that happen? Yeah. That's a lot for us. Rebecca: And that sent over 1,200 visits for us. So it was really neat. Nothing you could ever count on like that, but because it was worthy of being shared, it was and it was really impactful. So that was really cool to see happen. Kathleen: Doesn't it make you want to send an Edible Arrangement to those people? Rebecca: I know. I should have done that. You know what I should have done that. It might have scared the crap out of them. Kathleen: Exactly, exactly. But, it is so amazing how large of an impact certain individuals can have and the fact that that happened organically is incredible. It really is a great story about the power of inbound and PR when combined. I've seen like a lot of startups that I talk to think that PR is going to be this magic bullet that's going to do all the things that they need it to do in terms of amping up their marketing and building an audience and expanding the brand. But, I do feel like PR on its own generally isn't enough. There's only so many times reporters are gonna write stories about your product, or your service, or your company. But, when you have good data that's something that everybody likes. Rebecca: Yeah. I mean bloggers and media, they're content people too and they will only write about something worth writing about and so really, starting there and having something worth sharing is where it begins. No one in their right mind can share something that's not newsworthy. It makes sense. It's all about content. Kathleen: Yeah, that's so true. Wow that's really interesting. So you have that amazing initial bump that you got from this campaign and it didn't happen that long ago, but I'm curious if you've started to see has there been like a lasting evergreen effect of organic traffic coming in or do you continue to promote it? Rebecca: Yeah, great question. So first my fun fact. In October when we launched this, we doubled traffic from the prior month. Completely doubled for that, that was 17,000 visits in October which blew our minds. I was on my CEO's good list that week. It was very cool to have your expectations exceeded like that. So that was fun and then what actually ... it's been interesting because everything is new for us, everything we're doing for the first time. We have absolutely no benchmarks for ourselves. It's always how long ... well like to that question how long will we receive the results of this and we had a great October. November was just fine. I just call it fine from a traffic standpoint, sales standpoint just fine, and it was actually really good to experience that because one of the things I've learned from it is, in terms of our business at this very new phase, I need to make sure I have some big traffic event every month. I can't only rely on something that happened in October to make sure November is just as good. I need to keep it going. And sure, our organic search is improving over time, but that's gonna take so long until you can just rely on it. Rebecca: So at least in the foreseeable future I need to have a big traffic event every month and November I didn't. It hurt for that reason. That was actually a really big lesson that you can't necessarily rely on it for too too long or expect a big success like 17,000 visits in a month was your new normal. So that was neat to learn. Kathleen: Yeah, I imagine November must've felt like a website traffic hangover. What you woke up the next day and it's not still "party, party, party." Rebecca: Yes, yeah. It was good to learn. It was a bummer. Rebecca: But, it was good to confirm that so in my 2018 planning, for example, I always say "what is the big traffic thing every month that we can do?" Kathleen: It's so funny because when you said that you were your CEO's favorite person in October, what immediately sprang into my head was "but gosh, I hope he's not expecting that to be every single month" because you came out of the gates really strong and set a very high bar. So there's always that danger of doing your job too well. Rebecca: No, Max is wonderful. He gets it and he's in a really learning mindset and so it's really great to learn together and just continue experimenting. That was great. Kathleen: That's great. Well, I would love to also just hear a little bit from you about your experience coming in to a startup. As you said, you were in stealth mode when you first came in. You came from a really large company. I looked at your bio and know you joined back in 2008 at HubSpot when it was not that big of a company and you experienced tremendous growth within the organization and also in terms of your career because you started out in the marketing department and when you left you were a director of marketing at HubSpot. Presumably you had a big team, you had a considerable amount of resources to do marketing for HubSpot. I can't even imagine the shift that you must've experienced going from that to Owl Labs in stealth mode where, gosh, as a marketer that has to just go against every fiber of your being where you feel like your job is to talk about something and you're told "right now we can't." So I'd love to just hear, number 1, what that experience was like transitioning over and, number 2, particularly in the month of stealth mode, what kind of work did you do to lay the groundwork for when you were ready to start talking publicly? Rebecca: I have such fond memories of HubSpot. I tell people I grew up at HubSpot and I mean that pretty genuinely. So for even context for those listening, so when I joined HubSpot was 45 people. Really small. The marketing team was a handful. I think it was five. I was the fifth marketer. And those were really fun, crazy days. Extremely experimental. We had no idea what would work, but we had a really bold team that was open to trying everything. And I bring that up because I think that memory, and while I was in a very different position, I was a contributor not a leader necessarily at that moment. I think those memories really helped and even prepared me, and also the memory of loving it. I love it oh my goodness. So anyway, through the growth of the team, the marketing team was 150 when I left. Rebecca: Maybe 150 so really, really big phenomenal team and it had changed in a lot of ways that made sense for its size. The biggest one in terms of specialization. I mean, we had literally the best blog optimizer and the best UX person, and the best email, copywriter, I mean, you name it. Very, very specific specialties and for me I think why it fit is because it fit my natural career path where I wouldn't consider myself a specialist. What I like is getting my hands into each part. I'm not necessarily the expert, but I love trying and experimenting and my test for myself was "okay, let's put your money where your mouth is." Let's actually try doing this, and that's when I started looking for my next startup having that bug with the great support of HubSpot. Very, very thankful for that in terms of figuring out what my next move would be. Then fell in love with Owl Labs because of the product, because of my personal love for employees. So that was great. Now today, I mean I will say there's some things that surprised me. I'll give a few examples of things I did that I never thought I would do. 1. Design a logo. Yup. Kathleen: You designed the logo? Rebecca: Well I worked with a logo development team to actually design it, but in terms of like what we wanted, the messaging, what we wanted to create. I mean I was leading that having absolutely no idea what I was doing and I'm so proud of what we've come up with. It has all the elements I wanted in terms of being approachable, techy, and cool, but also very human. Anyway I love it. Kathleen: I love your logo. I'm looking at it because on my screen - so you can't hear this if you're listening, but we're using Zoom for this call - so I can see Rebecca and next to her name in my Zoom call is the little Owl Labs logo icon and it is the cutest little ... but you're right it's cute but not too cutesy. It is like modern and streamlined and techy, so job well done. Rebecca: It's everything I wanted. So that's an example of something I never thought I did. My first week at Owl I was creating like, I'd almost call mood boards of what our brand was going to be. Never done anything like that. I'm like literally conjuring the inbound team at HubSpot in my mind saying "okay brand, let's get into brand mode." So anyhow, things I had never done before and so fun. I'm getting so passionate about this I'm losing sight of the original question. Kathleen: Well you're answering it in a lot of ways. I think one part of it that I'm still curious about is that month of stealth mode because you come in and you know at some point you're gonna have to hit the gas pedal and go, but for the time being when you're told "we can't talk about this," as the new VP of Marketing, what did you do so that you'd be ready when you could speak publicly? Rebecca: Yup so I'm gonna tell you a secret. I'm actually really instinctual and I've learned to trust my instincts. Very instinctual and something I did that I was very proud of. So coming out of HubSpot, I actually had not yet secured my new role and I did that intentionally to give my self the space, and being a long time HubSpot alumni a lot of people were very curious what I was going to be doing and I was very honored to have a network that was curious. That's a great place to be in. And so when I joined Owl where one might think the next move is to update your Linkedin and to share it of Facebook, I didn't tell anybody. And the reason for it, I thought, you know what? We don't have an audience yet. I personally do, thankfully. I'm going to use my announcement of this move as one of my big levers to launch the company. So while I joined in April, I think it was the first Monday of April, we launched the company that first week of May. During that month, I didn't tell anybody, I was quiet as I could be. I was in my own stealth mode if you will. And what I did was prepare. We wanted to announce the fundraising we had somewhat recently received. It was a PR component and the other big one was myself in social. I wanted to use my social network and Medium. So I wrote ... it was actually really difficult because it was one of the most vulnerable things I've ever written before if you will. And then I wrote my story on Medium and that was one of the main levers and actually ended up being one of the pieces of content that was the strongest in introducing Owl Labs. That was one of the big pushes. So that was that first month thinking about "what do we have, what is available to announce the start of the company?" and I said "You know what? My network is one of them, so I'm gonna give it a shot." Kathleen: That is so wise the way you approached that. I think people really undervalue the power that Linkedin in particular has to spread that word. I know when I moved over to IMPACT I had to time very carefully my update of Linkedin similarly because I have a big network and, you know, I wanted to make sure and I owned my own agency before coming to IMPACT so this was the first career move in quite a long time as I know yours was as well. So I wanted to make sure my whole Linkedin was rebranded and all the links were set up and you know when you make any change on Linkedin, I don't know if most people realize this, but if you make any change on Linkedin and you have a choice there's a little button you can toggle that says either do or do not tell people. So knowing when to toggle that button and time it so that when somebody does see that update everything is in place and it's ready to go is so critical. On the Medium article I'm really curious did you just publish that on your own or was it published as part of a bigger Medium publication? Rebecca: Yeah it was on my own. I didn't have a very large following on Medium. I had published two articles for HubSpot prior that I had written and published via my name on the HubSpot network on Medium. And so I had a few followers there. Not anything substantial. So it was on my own account. What was interesting after ... Medium's fascinating. After it started to take off, a startup publication asked if they could publish it on theirs, which is like the same article that then becomes showcased in a different Medium publication. I thought, why not? So that was really cool that it was something that was worthy of another publication and that helped a bit, but really it's the power of those social components on Medium where people clap and recommend, etc. It's very cool and I think because I made it very personal, my friends, my family, my HubSpot network, my marketing network, I mean, you name it, was very very supportive and their support then brought it to their own networks if you will to introduce it. I was very proud. It worked better than I thought. I think it was in the course of that week or so it was 2500 visits to the post. Rebecca: Which starting from nearly nothing on Medium I was really happy about that. But, I would say for anyone who's curious about Medium what I have learned is you have to be very personal. It's almost like the journal. It's when people use to think blogging was journaling well it's kind of like journaling. Kathleen: Yeah. It is interesting. It's something that I've really been taking a closer look at recently and I agree with you. In general, I think content that is more personal does tend to perform better. I mean, there's so much content out there these days. It's super saturated. We're all kind of at the point where our eyes are glazing over with the blogs and the articles and this and that, but the things that are personal that go to a level that people don't expect and that kind of surprise are the things that really stand out. Kathleen: That is great. Well a couple of questions in closing for you. You're somebody who has had a very interesting career trajectory with HubSpot and now with Owl Labs. You've been in big companies, you've been in small companies. I assume also have had exposure to the way a lot of people do inbound marketing. I mean, HubSpot pretty much coined the term. I'm curious - when you look out into the world of companies, brands, individuals, who do you think is doing inbound marketing really well? Rebecca: Yeah so these days, now that I'm an ecomm gal, I've been especially paying attention to companies that are doing eCommerce marketing really really well and showcasing their product in a really interesting way. We need to be able to do that really well ourselves and so I'm always keeping a look out. Let me tell you something, I love falling for Instagram ads. Like, I don't know what it is as a marketer when I say "oh that's good and I'm going to do it." Kathleen: Yeah. You know it's happening and you go forward anyway. Rebecca: Absolutely. I appreciate the marketing and I appreciate that I'm a result in their dashboard somewhere. Rebecca: So one of the things that I've learned that I really like and I think it's because I'm really in a focus of generating new audiences and introducing Owl Labs to new audiences and I do think that paid channels can be really strong for that. So thus the Instagram ads. And so you obviously want to use this paid in a way and think really thoughtfully about what is the content of your ad if you will. And I'm loving what people are doing around video ads etc. So anyway the long and the short of it is there is an organization - a fitness group - started in New York City came to Boston, I'm not sure what other cities, but it's called 305 Fitness. Anyone who knows me knows I love Zumba. I love exercise. Aerobic exercise classes are my favorite. Gets me all pumped and they have the most beautiful video that was just these women in this class killing it and doing great and it was a featured Instagram ad and I could literally feel the energy that would be in this class through this amazing video. Anyway the long short of it I signed up and it was great. So 305 Fitness I think is doing a really great job capturing the emotional response you would from a class, the true value of the product, through content. Remember in content it still is important through and through and then obviously I don't know what their target is but I was their audience. Kathleen: You're right. They found you. They knew that you liked those classes. That's a great example too because that's a very competitive space. You know the fitness space and it's a space where everybody is using video, everybody is using imagery. So to stand out and do it so well in that space is very impressive. I will put the link to that in the show notes. I will also put a link to your Medium post. Last question for you is how do you stay educated and on the cutting edge of things happening in marketing? Rebecca: That's so hard and it's funny at HubSpot I feel like I did it so much better because, well, one you had a little bit more room and time. In the startup world I mean you are just go, go, go, go. So two different answers. 1. I mean truthfully being bold and trying new things. Just being someone who experiments herself and seeing what wins and what's loses. Always iterating. That's one. So I guess that's an internal source of learning and just always keeping that in the front of my mind. The other piece is my network and I know it's really cliché, but I love Linkedin these days. The Linkedin feed has become my new Twitter feed. I'm not looking at my Twitter feed anymore and I'm looking at my Linkedin feed. And people are getting really great at sharing their own content and their own personal videos, etc. So I'm really, really appreciating that and following what other folks are sharing that is value to them and they're including pieces of why it's valued. So that's been really great in terms of getting that creative content. I've been really impressed lately. Kathleen: That's a great suggestion. I have actually been recommitting myself to Twitter funny enough. But, one of the lessons I've learned and I think it can apply to Linkedin too is it's not necessarily so much about the platform, it's about how you curate your community of people. I use to follow so many people on Twitter and when I got back into Twitter I unfollowed 80 percent of the people that I was connected with because it was cluttering up my feed and it wasn't valuable. And now that I've gotten rid of all that noise, Twitter once again is this rich resource for me and it sounds like that what you're finding in Linkedin is that the network you have is really valuable in terms of what their sharing. Rebecca: Yeah that's exactly right. I've been loving it. Maybe I'll have to do the same and clean out my Twitter because my Twitter ... no offense to my wonderful folks that I follow, there's a lot of junk and I don't have the time to curate with my mind. I need it to be done through the technology. Kathleen: Yeah that's so true. Well thank you so much. This has been so interesting to me. I can't wait to share some of the resources you mentioned in the show notes. If someone has questions and wants to follow up with you and learn more about the campaigns or learn more about the Owl what's the best way for them to find you online? Rebecca: Yeah so a few different ways you can go to Owllabs.com. Check it out. I designed the website. Rebecca: And the logo. So tell me what you think. So check out our website. We're also on Twitter as Owl Labs Inc. If you'd like to talk to me directly - I'm gonna sound like a bit of a contradiction - when people @ me directly on Twitter I look at all of those. So I'm @Repcor on Twitter, Repcor. I love to talk to people there. And I'd love to chat with you later. Kathleen: Great! Well, thank you again. Thanks to everyone listening. If you enjoyed this episode please give us a review on iTunes or Stitcher. That always helps a lot. You know, we're kind of like a podcast version of a startup. So all that social love helps us rise to the top. And if you know somebody else who's doing really great inbound marketing work and getting awesome results, please tweet me at @WorkMommyWork and let me know. I'd love to interview them. That's it for this week.